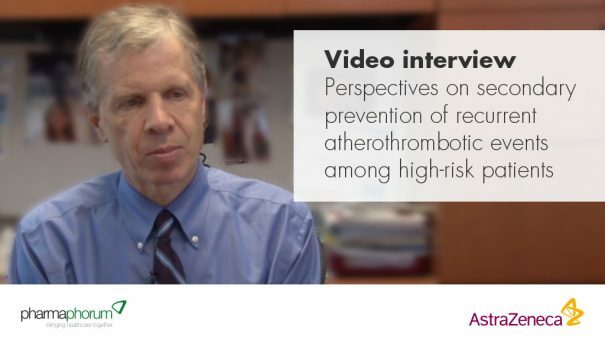 As part of the roundtable debate on secondary prevention of recurrent atherothrombotic events, Dr Paul Tunnah speaks with a participant, a leading expert in the field, Professor Christopher Granger, to hear his perspectives on secondary prevention. In conjunction with the roundtable video debate, pharmaphorum are releasing individual video interviews with the four expert participants. Here, Professor Christopher Granger provides a US perspective on secondary prevention. 00:12 – How is the drive to reduce the cost of readmission impacting secondary prevention in the United States? 01:42 – Where do you see differences in how we’re addressing this between non-ST elevation and ST elevation in primary events? 02:53 – Why do you think that non-STEMI is increasing and STEMI is decreasing? 03:53 – What are some of the key differences between the European and the US guidelines? 05:07 – In which areas in particular do you see a discrepancy in the use of guidelines? 06:46 – Do you see evidence with the teach back/call back/come back programme that it improves things like adherence to medication, adherence to treatment schedule and therefore outcomes? 08:36 – How applicable do you think the US guidelines are to other countries, particularly ones that have very different healthcare infrastructures? 09:14 – Are there other tools that you think are interesting to help physicians follow the guidelines? 10:29 – How well do you feel that risk of anti-platelet therapy is routinely communicated to patients and how well understood is the risk/reward profile? 10:57 – Do you see elements of systems that tie reimbursement to outcomes, whether that is government driven, professional association driven, or indeed private healthcare systems driven, which are being translated to other countries globally? 12:06 – Are there any best practice examples from other countries that you think the United States or other countries should be embracing?